Rated 4 out of 5 by Sharon from Ponds moisturizer with Sun screen I like this product very much. It leaves the skin nice an soft. The only thing I didn't care for was the medicinal smell. Rated 4 out of 5 by Abby1991 from Good Product I was pleased with how well this product worked. Normally I don't use anything with sunscreen. Rated 4 out of 5 by donnamp from A pleasant surprise! This one was a pleasant surprise for me - I expected the sunscreen to leave a white cast since it is zinc/titanium dioxide but it really leaves a nice finish on my skin - not too white and moisturizing without being too oily. The only thing that I wish for in this product was a fragrance free version. The scent is not bad, but I prefer scent free products and it is safer overall to avoid fragrance in skincare products since you could develop a fragrance allergy. Rated 1 out of 5 by PrettyEyes from Not My Cup of Tea! This product did not work well for me. I only used a small amount and I ended up looking as white as a ghost. This is coming from a dark skinned black woman. Rated 5 out of 5 by Mary377 from Great product I started using the next day I received it on the mail. I recommend this product, it is not only a sunscreen but also a moisturizer. Your skin doesn't feel or looks as with the regular sunscreen. I used mine every day before going out and seems to work. Thank you Ponds! Rated 5 out of 5 by BOBBIE290 from great product THIS PRODUCT IS LIGHT ON OU SKIN YET KEEPS YOUR SKIN MOIST. OTHER PRODUCTS I HAVE USED WERE HEAVY AND LEFT AN OIL FLIM. I FOUND THIS PRODUCT IS PERFECT ALSO AS A PRIMER FOR POWDER MAKE UP. ON TOP OF BEING SO LIGHT I USE IT IN THE AM, AFTER A WORK OUT AND BEFORE BED. 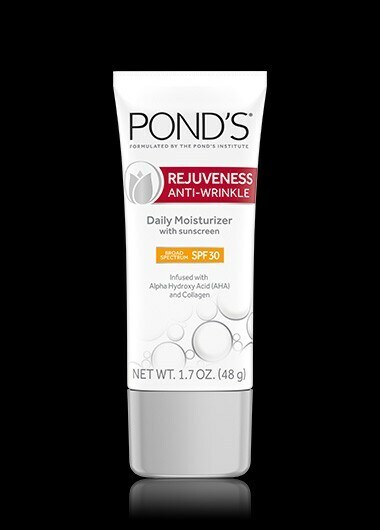 Rated 4 out of 5 by Mixter from Ponds moisturizer with sunscreen I loved it I normally dont wear sunscreen or moisturizer. Most of the time moisturizers and sunscreens are to greasy. This was not could barely tell it was on. Rated 3 out of 5 by Savmc from Like the moisturizer don’t love the smell Does a good job for the most part. Not too thick. A little bit goes a long way. I like that. The smell isn’t terrible but I don’t love it either. Rated 4 out of 5 by Lily8604 from Good product I like how it does not feel heavy like some products with sunscreen do. It provides very good moisture for my skin during these cold months. Rated 1 out of 5 by jordie from Ponds SPF I did not like this because it dried my face out and left a powder like residue on it. I will stick to my Ponds cold cream. Rated 5 out of 5 by Alex2 from Great! I really enjoy this product! I have sensitive skin and it doesn’t break me out or dry it out. Rated 5 out of 5 by Mickey from Great! A little goes a long way. Very hydrating and non-greasy.